4. 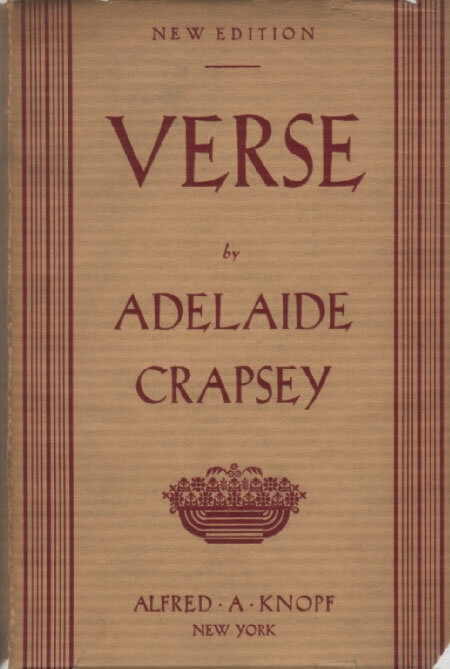 Adelaide Crapsey (1878-1914). Cinquains. In Verse. [Rochester, N. Y]: Manas, 1915. Enlarged ed., New York, Knopf, 1938. Several critics have noted that Crapsey’s series of ‘Cinquains’, each consisting of five brief imagistic lines, are indebted to Japanese poetics, sometimes to particular hokku or tanka as they appear in the translations of, especially, Porter (D20) and Revon (D21). The first to draw the connection was Louis Untermeyer, in Modern American Poetry (New York: Harcourt, Bruce and Howe, 1919); the fullest study is Kawanami Hideo’s ‘Adelaide Crapsey to Michel Revon: Nippon bungaku to kanrenshite’ (Crapsey and Revon in relation to Japanese literature, Ôsaka shôgyô daigaku ronshû 19-20 : 210-237), which traces particular poems to Revon’s translations of Sakanoue no Korenori, Fujiwara no Koremoto, Buson (Ap), and Issa (Ap), and pages from Crapsey’s poetry journal to Noguchi’s From the Eastern Sea (15e1). See also Taketomo (A8), Snow (A12), Hall (A16), Seaver (A17), Kimura (A23), Miner (A25), Ôtake (A35), Lewin (A46), Durnell (A55), Kawano (A57), Kodama (A59 and 69), Fletcher (BH15), and de Chasca (BH29), and notes at D3, 15d, 20, and 21.